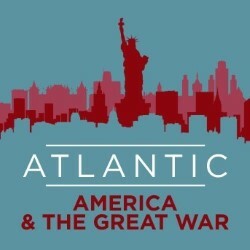 One of two new shows sharing similar themes, Atlantic: America and the Great War follows the lives of two sisters as one leaves for war one one stays behind. The story is slightly confusing at the start but soon settles down. Very much a contemporary ensemble show, it starts off straight away with beautiful ensemble singing and lovely harmony lines. The music is excellent throughout and the strong ensemble numbers sound fabulous, some smaller solo moments do get lost (no mics) but this doesn’t detract too much. The small band again provide an excellent accompaniment. This is an ensemble show but special mention has to be made of Abigail Stephenson as Annabelle, simply excellent and a pure delight to watch. Neal Davidson and everyone else were also working very hard throughout, a pleasure to watch. A really lovely piece, the two Atlantic shows make excellent complements to each other and well worth catching.